Rooms are designated areas of your prison that provide specific functions. 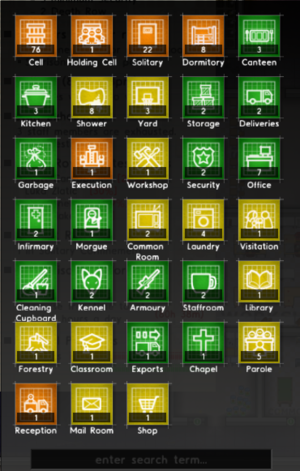 To designate an empty space as a particular room, select the rooms menu from the main icon panel, select the desired room from the list, then left click and drag over where you want the room to be. To remove a room designation, right click and drag over the room(s) you want to remove. Designated rooms show a colored chessboard overlay and the name of the room. When an office is claimed, its name is changed to reflect the administrator who now occupies that particular office. Some rooms have various requirements to become functional. To view the minimum requirements for the room, mouse-over the room type, and a pop-up will state what is required. Once constructed, a room will display a warning symbol if any minimum requirement is not met. The mouse-over text will state the missing components that are needed in order to make the room functional. Designating rooms does not cause any costs directly. Building any foundations around them will, and so will putting floor materials under outdoor rooms, and of course equipping the room with objects that may be required or wanted. However, some rooms will cause items to be purchased automatically for the room to be filled with (e.g. Bleach for the Cleaning Cupboard or Trees for the Forestry), which might sum up to substantial amounts of money depending on the room size. Solitary An isolated cell used as punishment for Misconduct. Canteen Where your prisoners go to eat meals during "Eat" time in Regime, and possibly your staff during their breaks. Kitchen An area for cooks to prepare food for your prisoners before delivering meals to the Canteen. Shower Used to keep your prisoners squeaky clean, and lice free. Prisoners will report here during "Shower" and "Free Time" time in Regime. Storage An area designated to hold any materials delivered to your prison but not currently in use. Execution Where you send your prisoners to die. Infirmary Area for your medical staff to work. When injured, Prisoners and Staff will be escorted by a Guard to the Infirmary to receive medical attention. Morgue Where you store your dead prisoners and staff while awaiting a Hearse to take them away. Common Room A space to allow your prisoners to relax. Laundry A place to wash and press your prisoner uniforms. Prisoners will report here during "Work" time in Regime if there are jobs available. Visitation A place for family members and lawyers to meet with Prisoners in person. Armoury A room for storing equipment and gear for the armed guards. Reception Room where prisoners will be taken when they first arrive. Nursery Activity room for female prisoners with babies. If rooms have to be enclosed, be sure only marking the floor. Do not include outer doors in that assigned area. Otherwise, this condition is not met.